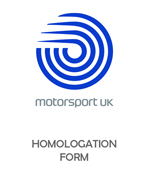 In the drop down menu at the top of the page select in the Motorsport section "Homologated Vehicles" and click "Go". ÊPlease add the Homologation number of your car in the box provided below. For Extension Papers please telephone the Sales Team during Office Hours. UK Postage Price includes UK Postage and Packing via normal postal services but if you need the book urgently you may, at Checkout, select a faster service at additional cost. If the book is to be sent Overseas you must select the appropriate Postage rate at Checkout.